If you're scared of snakes, just skip this one and go to the next, ok? But remember people are allowed to like different things. First some background. 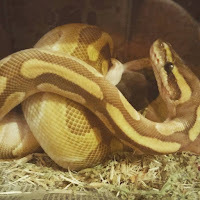 A friend of mine got a ball python called Noodle, and my boyfriend and I met him when we went to visit. I'd never considered snakes as a pet before, I thought they'd hate it and would much rather be in the wild. And besides, you can't play with a snake or cuddle up with it. I was very wrong. Noodle was strangely cute, with his little puppy-dog mouth and his tentative way of exploring your clothes. He curled up in my hood and sniffed my ear with his tongue, and seemed very happy indeed to be slithering around all these warm trees. I've been wanting a pet for so long, but I don't have the time or money yet for a dog or anything else, especially with renting houses and landlords being funny about fur. This is Cuddles the ball python! 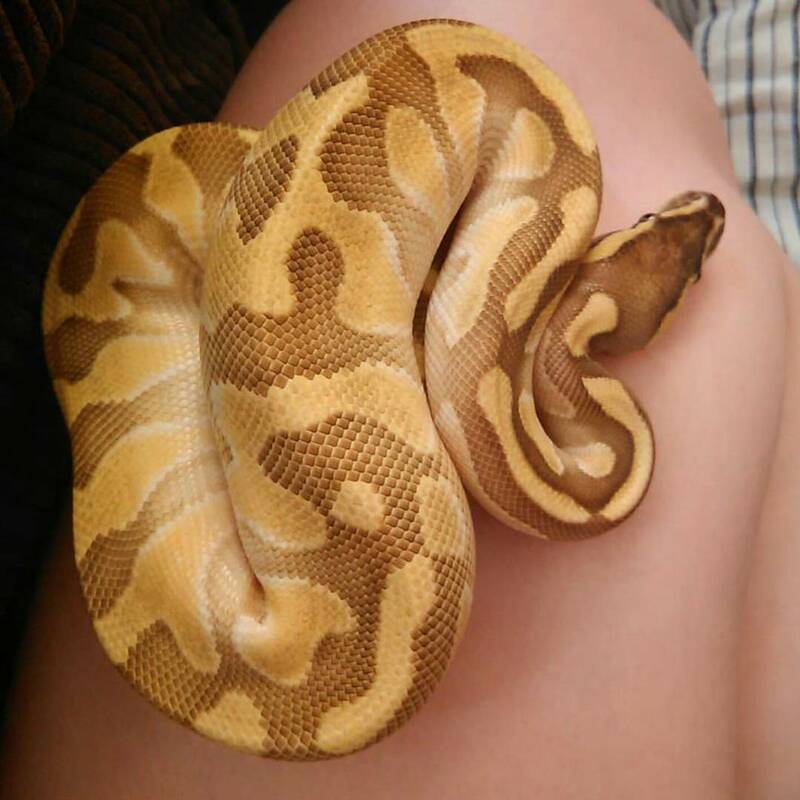 You'll notice how he's not your typical looking snake, being bright yellow and all. In my research I discovered that ball pythons have literally thousands of different genes for patterns and colours, so an impossible number of visual morphs, most of which haven't even been created yet. It re-kindled my love of genetics from Biology back in school, and I spent a long time on the internet looking them up. 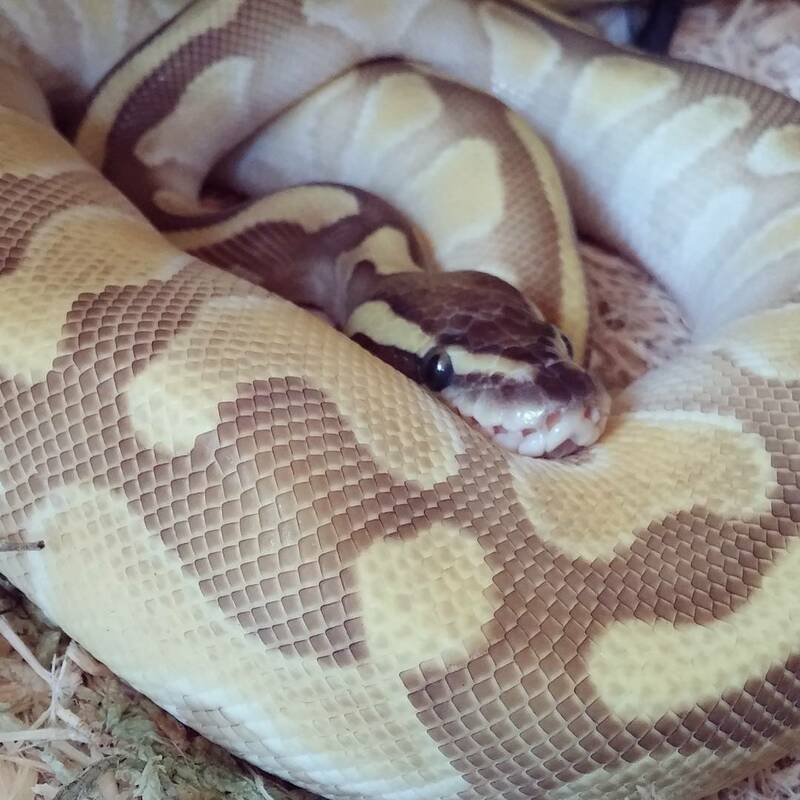 Cuddles has three co-dominant traits- 'Enchi', 'Lesser', and 'Fire'. 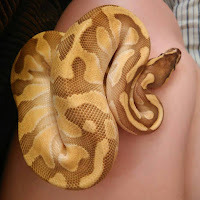 'Enchi' changes the pattern and makes more yellow, 'Lesser' gives him a cleaner pattern that fades to a cute little white belly, and 'Fire' makes little flame patterns on his sides and makes his yellows brighter. He's such a pretty little fellow. I really could talk about snakes for days. It's like when someone has a baby and all they can talk about is their baby, so I try to recognise when the person I'm talking to has had enough. He's a shared pet with my lovely boyfriend, which is a pretty big step for me. Now we've got a little snake family together. Since getting Cuddles in June we've actually bought another snake and got two rescue ones. I'll write more about them in a later post though, enough snaking for one day.